JUNCTION, TX — UPDATE Tuesday, Oct 9, 2018 at 3 p.m. The missing from the flood in Junction includes three males and one female, according to Texas Parks and Wildlife Game Warden Rachel Kellner. The names are not being released officially since authorities consider it an active search and rescue operation. Boats, helicopters and a drone are being used to patrol the Llano River from where the RV park was washed away northeastward towards the Kimble-Mason County line. Kellner said the search area is about 35 miles long. UPDATE Tuesday, Oct. 9, 2018 1 p.m.: Four individuals are still missing, according to an official statement from officials directing search and rescue operations in Kimble County and the City of Junction. At an RV park, 45 people were evacuated yesterday, 19 of them were rescued from floodwaters. The Llano River continues to rise, with water from last night’s rains flowing into the river. Officials expect better weather conditions Tuesday afternoon and additional boat teams and aviation assets have been positioned to take advantage of the break in bad weather. Because of the volume of search and rescue aviation assets in the air, a temporary flight restriction is in place over the area until further notice. Agencies assisting in the operation include: Texas Department of Public Safety, TMI Solutions, U.S. Border Patrol, Texas Department of Transportation, Texas Division of Emergency Management, Texas Parks and Wildlife, Texas A&M Forest Service, Texas Search and Rescue, Eldorado VFD, London VFD, Junction VFD and Kimble County Sheriff Office. 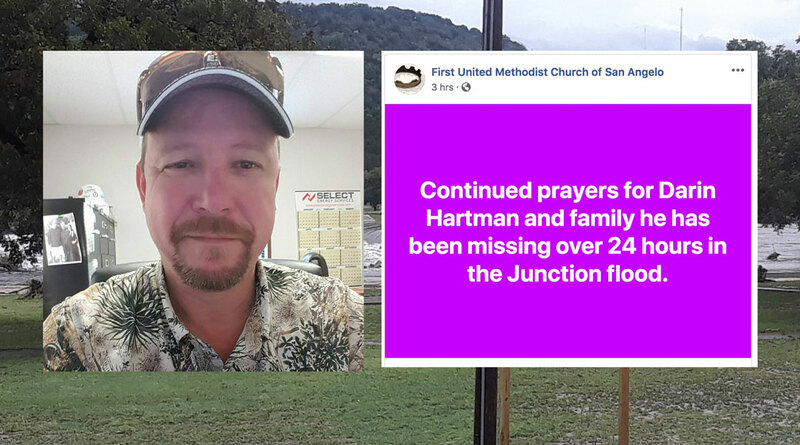 UPDATE Tuesday, Oct. 9, 2018 11:30 a.m. First United Methodist Church of San Angelo posted on their Facebook page that a San Angelo man, Darin Hartman, has been missing in the flood for over 24 hours. JUNCTION, TX -- Kimble County Sheriff Hilario Cantu says there are no confirmed deaths at this time but four people are presumed missing after the Llano River flowed out of its banks early Monday morning in Junction. As we reported earlier, the Texas Department of Public Safety was on the scene performing water rescues and were joined by several state agencies. Sheriff Cantu said electricity was out Monday morning but had been restored. The National Weather Service office estimated over 12 inches of rain fell in the area causing the flooding and prompting a flash flood warning through Wednesday. 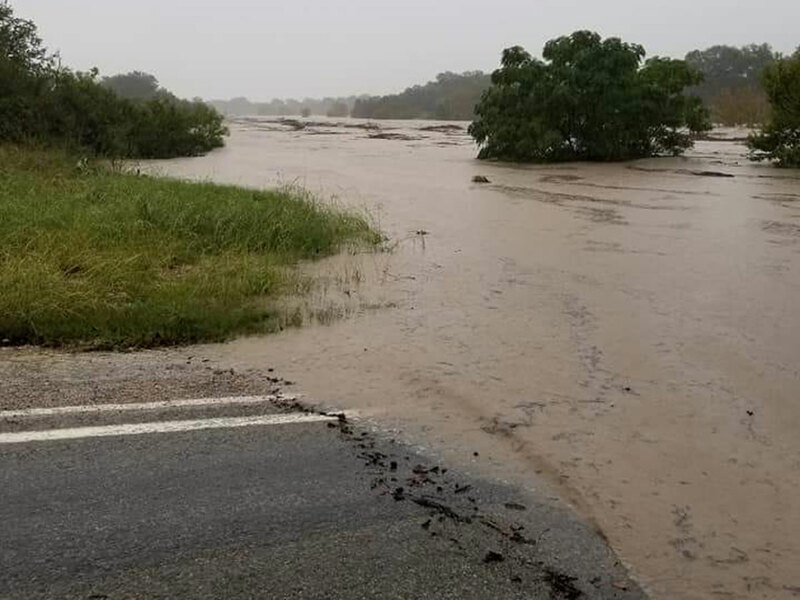 Social media videos show flooding of the Llano River through Junction and in surrounding creeks and draws. There were numerous videos of helicopter water rescues and high water in Junction. The NWS also forecasts heavy rainfall across west central Texas including possibly in the San Angelo and Junction areas. There is a 90 percent chance of heavy rain in the Concho Valley tonight and a 60 percent chance of additional rainfall in Junction. The Concho Valley remains under a flash flood watch while Junction and all of Kimble County remains under a flash flood warning.